View from a bridge: A-457 with train 501 from Thessaloniki. The unit obviously had a fire in the radiator area. The short hood holds the steam generator. Athens Larissa station, June 25th, 1997. Montreal Locomotive Works continued delivering ALCo design products in all directions of the world. 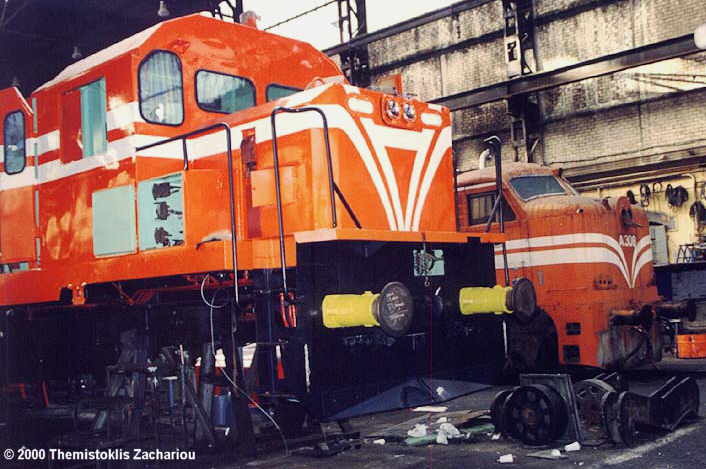 They delivered a high-nose version of their export M-liners in 1974 to Europe - Big Ms for the Hellenic Railways! The dynamic brake-equipped were used mostly in heavy freight and passenger service between Athens and Thessaloniki and between Thessaloniki and Alexandroupolis until 1998. Then the class replaced the A-321 workings on the Kozani line until DMUs took over most traffic there. All 20 of them are still on the roster, but now for freight traffic. A couple of MX-627s are assigned to Athens but the bigger share now operates from Thessaloniki. On April 13th 98 A-459 failed with train 504 shortly after leaving Athens. 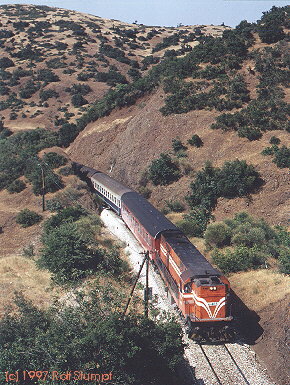 The train then sat for over an hour near Acharne before being pulled back to Athens by Adtranz unit A-472. This was the first passenger working (though only some kms short...) of the new class in Greece! The next day train 500 ex Athens was Adtranz-powered for the first time! This was the beginning of the end, folks! March 99: The MLWs are quoted as still being the regular power on the "Hellas Express" from Thessaloniki to Idomeni. In April 99, one MLW each served as the well known "Thunderbirds" at Lianokladi (A-467) and Larissa (A-470). In the near future the class are expected to undergo a refurbishment program at the Hellenic shipyards. They will lose their steam heating equipment, get a cut down nose but will retain the existing diesel engine. 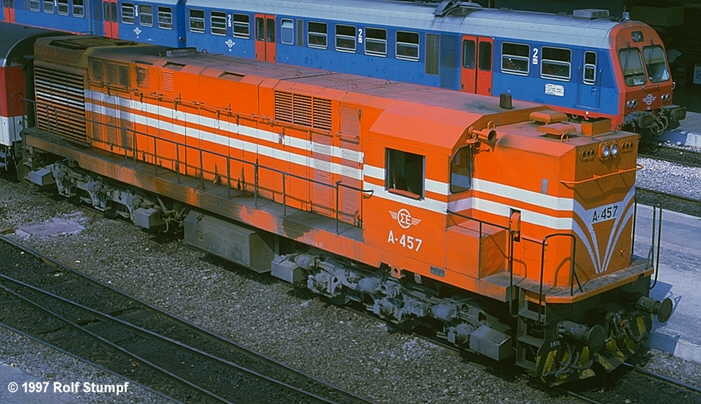 A-461 is the first unit of the refurbishment program, it was back in service on August 28th 2000. Every (work? )day at noon a freight leaves Thessaloniki for Athens. A-461 is nearing completion in the Pireas shops. The steam heating equipment in the short hood was removed and so the nose could be chopped down rendering a better visibilty for the crew. Pireas shops, June 2000. Note A-308 next to the MX627. Alas, the DL500 was only for part-stripping inside the works.